Blakeney is situated on the North Norfolk coast in an area of outstanding natural beauty and remains largely untouched by the pace and commercialism of modern life. The village is recorded in the Doomsday Book of 1086 and until 100 years ago, it was a flourishing port for North Sea trade. The picturesque harbour is now a popular spot for sailors and visitors wishing to take one of the daily trips to the Nature Reserve at Blakeney Point. Visitors cannot fail to be impressed by Blakeney’s charm, whether it is the winding streets of flint cottages, the Nature Reserve or the unspoilt beauty of the marshland coast. The Harbour Room was completed in 2005. 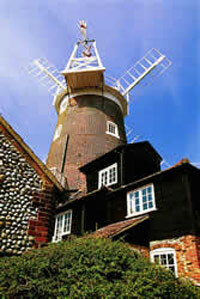 It was built to replace a wooden hall which was donated to the ex-servicemen of Blakeney in 1923. With state of the art sound and lighting equipment together with computer facilities and an overhead projector, licensed bars, dance floor and staging as well as a fully fitted caterer’s kitchen, the Harbour Room provides the perfect venue for any special occasion. Our catering partners will be happy to discuss any special requests or create a menu to suit your occasion – we can cater for up to 250 for a finger buffet and 140 for a seated Reception with private car parking for the convenience of your guests.